Everyone knows that honeybees are good for your garden. They are natural pollinators and all around good guys. But what about the other flying, buzzing garden visitors; wasps, yellowjackets, and hornets? Are they pests? If you have a garden, you might be surprised at the answer. Wasps get a bad rap. They can be persistent when they want to join your backyard BBQ, and they have a reputation for aggressively protecting their nests. When it comes to natural pest control for your vegetable garden, wasps are some of best natural predators for controlling beetles, caterpillars, and other garden vermin. While wasps do not collect pollen or cross pollinate like honey bees, they still help plants that self pollinate, like beans, tomatoes or peppers. These self pollinators still need the stigma and anthers in the flower to brush each other either by touch or vibration from the wind or from an insect like a wasp paying a visit. 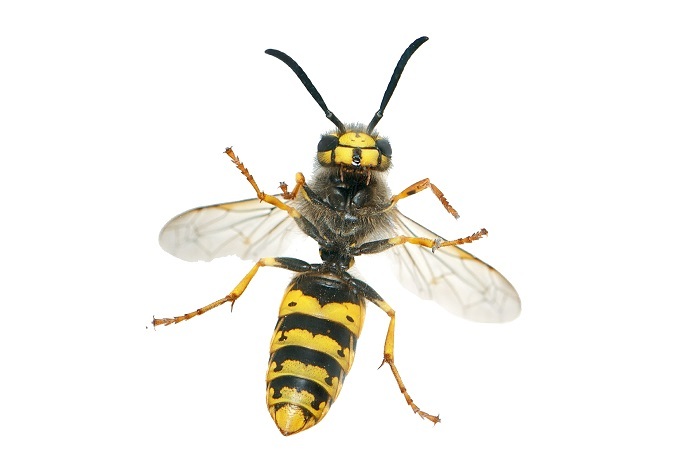 There are several types of wasps in Utah that are worth attracting to your garden. They mostly fall into two categories: social wasps and solitary wasps. Social wasps are those that build nests around a queen and form a community. One example is the common paper wasp that builds papery grey nests out of chewed up pulp and plant fiber. These wasps can be aggressive when it comes to protecting their nest and territory, but if they have built their nest in an out of the way spot, you may want to let them be. They specialize in eliminating the caterpillars that can decimate your garden. Solitary wasps tend to be a little more “live and let live,” meaning they won’t bother you if you don’t bother them. Also known as cavity-dwelling wasps, they like to live solo in hollow tubes, small tight spaces, old stumps and sometimes even holes in the ground. It is easy to make wasp homes for solitary wasps by drilling holes in untreated blocks of wood or bundling together some dried out, short and hollow bamboo stalks. Vegetable gardens that have wasp visitors have up to a 30% higher vegetable yield and far fewer problems with pests. Even large commercial growers have discovered this and work to get wasps to nest nearby. But how do you have a wasp habitat in your yard without having them become pests? First, wasps need their space. Build a wasp house on the outskirts of your yard in an area where they won’t be disturbed. Watch for nests in high-traffic areas and relocate them while the nest is small. At night when the wasps are sleeping, you can put a plastic container around it, slide a stiff piece of cardboard over the opening and move it to a better spot. The wasps will often relocate to a more secluded area if this happens. Finally, provide wasps with ample hunting ground (your garden) so they won’t stalk your backyard BBQ.